The history of Vladivostok is inseparable from the history of fortress built more than century ago for protection of military post and civil settlement, later – port city at Pacific coast. This fortress is well known as a monument to Russian military-defensive architecture. In fact, well preserved forts impress us with their power even in present time. Suffice it to say that the thickness of concrete coatings comes to four meters, ready to withstand artillery cannonade from guns of any caliber. During Russo-Japanese War enemy's armor-plated ships approaching Vladivostok could not pierce these walls by their naval artillery. 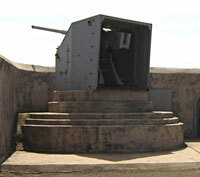 Since 1862 Bezymyannaya battery had been located on the place of Vladivostok Fortress museum. There were 4 smoothbore cannons, and on the eastern downhill – barracks for mountain artillery platoon. Later on, by the end of XIX century, battery's earthworks were completely rebuilt under auspices of military engineer Yakubovsky. But more thorough works were performed in 1910, shortly before the beginning of WW1. Those constructions – casemates, gun enclosures – are preserved to the present day. Dozens and hundreds of journalists, tourists and city guests visit the wind-blown museum everyday. Normally, people try to go to a tour at noon, because just in 12.00 a traditional signal-gun of one of combat ships may be heard at Batareynaya hill (named after the first Russian battery). The sound propagates far over the city. One may synchronize watch with the sound. This tradition had been kept in Vladivostok since 1914, was broken off in the early 1990-ies and renewed 10 years ago by Primorsky Krai branch of National Trust Society and Pacific Fleet command. Another visiting card of the city is a "grandpa" of fleet's modern combat ships memorial corvette Krasny Vympel moored forever at Korabelnaya shore front. The history of this small-size vessel with gracefully crooked stempost, tall masts and slightly inclined smoke funnel began in April 1911, when a single-rotor double-decked steam yacht was built in Finnish shipyard Creighton and named after Vasily Zavoiko, Kamchatka Governor and leader of defense of Petropavlovsk-on-Kamchatka city during Crimean war 1853-1856. The vessel's first home port was Revel, and then it cruised through the Baltic, the Atlantic, Suez Canal, Indian and Pacific Oceans to Kamchatka. On May 31, 1923 yacht Admiral Zavoiko was renamed and reassigned as advice ship of the Far East Fleet. In 1924-1925 Krasny Vympel had been protecting sea border, then helping scientists and marine hydrographers to explore water area of the Sea of Japan. Well after, in 1958 military council of Pacific Fleet ordered to reconstruct old ship into floating museum, tourists' beloved picture-taking site. Among pride-worthy special educational institutions of the Far East the first row takes Pacific Naval Institute (PNI) named after Vice Admiral Stepan Makarov, the famed naval leader and scientist. The necessity to create such institution in 30-ies of the last century was essential, since the situation in Asian-Pacific region was disquiet due to invasive plans of Japan. The creation of powerful Pacific Fleet was in progress and it needed officers. The site for new naval school was selected uptown Vladivostok, on Sapernaya hills where barracks of engineer battalion were located since 1905, and after the revolution and Civil War was the residence of railway personnel. "We arrived to Vladivostok by special train from Leningrad on January 30, 1938", recalled Capt 1st rank retired Georgy Makarov, graduated in 1941. "We were 329, just finished first term of Frunze Naval School. 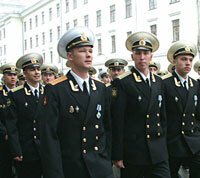 I distinctly recall that Flagman 1st rank Nikolai Kuznetsov, Pacific Fleet Commander appeared before cadets. His speech affected us much, we start studying with extraordinary inspiration. But apart from acquisition of naval science elementaries, we were laying brickwalls, paintworking, carpentered – in fine, burnishing the school. During Great Patriotic War a number of graduates and cadets of the school served at fighting fleets and land fronts. And everywhere they fought fearlessly. Names of Heroes of the Soviet Union Vasily Bykov, Ivan Avelichev, Mikhail Panikahi etc. are enrolled on the school's list forever. During decades from its foundation, this naval school (since 1998 – institute) has trained 19 000 officers. Among its graduates 17 were awarded with higher state rewards, over 200 obtained admiral and general ranks. On April 21, 1954 the naval school was named after S.O. Makarov. In this period the school's infrastructure has been considerably changed. To train qualified experts, PNI possesses labs and cabinets equipped with state-of-the-art facilities, division of training boats, training missile battery, training airdrome. Future officers are studied at five departments and have practical training at Pacific Fleet combat ships. 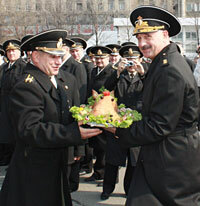 "Our institute has glorious battle history", says Capt 1st rank Igor Leukhin, commander of PNI. "The educatees serve at all fleets worthily continuing traditions established by first graduates. The institute is currently being reorganized; officers and civil teaching staff treat that process intelligently. It is planned to integrate several departments and faculties, to decrease enrolment. For the first time the group of girls will be enrolled at department of radio communications, and on facilities of technical school it is supposed to train sergeants for the Navy. The main objective is to enhance quality component of training.